Forest City Fashionista: "We All Dressed For Bill"
The "Bill" in the title of this post would be William (Bill) J. Cunningham, street photographer extraordinaire, who passed away yesterday in New York at the age of 87. If you're not familiar with Bill Cunningham, I suggest you watch the 2010 documentary by Richard Press, Bill Cunningham New York, or read the 2009 profile in New Yorker magazine, or some of the lengthy articles currently in the New York Times, where Cunningham worked for almost 40 years documenting the fashion parade on the streets of the city. Wearing his uniform of a blue French worker's jacket, khakis, and black sneakers, pedaling his bicycle through the streets of New York with camera in hand, he was a New York icon, and in fact, was designated a "living landmark" in 2009 by the New York Landmarks Conservancy. 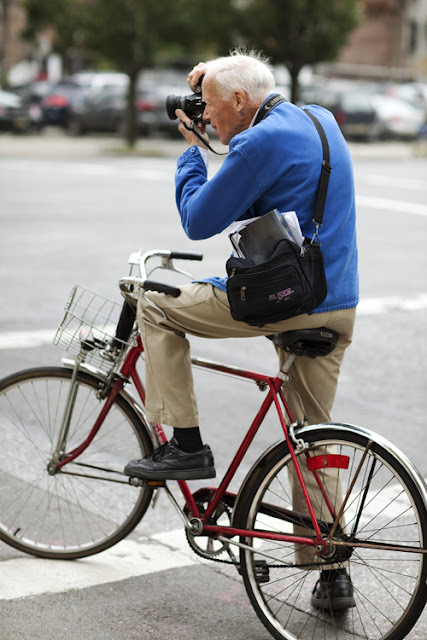 In an article he wrote for the New York Times in 2002, Cunningham referred to himself as a "Record Keeper"
Bill Cunningham was an important inspiration for me when I decided to start my blog. I was familiar with his work from the style pages of the New York Times - I loved his weekly video series, "On the Street" which included his voice overs - and was inspired by the joy he found in documenting what people were wearing. He went everywhere - fashion shows, fund-raisers, parties, or his favourite observation corner of Fifth Avenue and 57th Street. He was known to attend multiple events in one evening, spending only a few minutes at each one getting a few photos and then hopping on his bicycle and heading off into the night. I will confess that at one point I entertained the fantasy of being the female version of Bill Cunningham in London, Ontario. The thing is, no one else can, or could duplicate what he was doing, because no one else had his eye for THE thing, the detail, the colour, the tilt of a hat, the tie of a scarf - whatever it was that made something special enough to be captured by his camera lens. He had an appreciation for the eccentrics and creative dressers, and was a gentle, kind, and humble man. It was always about the subject, never about him, and he tried to remain as anonymous as possible when he was out shooting. The photo above was taken during my most recent trip to New York, when I was out for dinner with the Idiosyncratic Fashionistas. I'm holding my treasured "Bill Cunningham" necklace made of Perler beads by Victor-John Villanueva. New York was the only place I could wear it where people actually knew who it represented. So of course, as a huge fan of Mr. Cunningham, my ultimate wish was to see him on the street or at an event during one of my visits to New York. When I was there in October 2011, I arrived at the Manhattan Vintage Show only to learn that "I had just missed Bill". This happened again the following year, and I began to think I would never see him in person. My friends, The Idiosyncratic Fashionistas, had been photographed by Cunningham several times, as had a number of the other women I knew in New York. 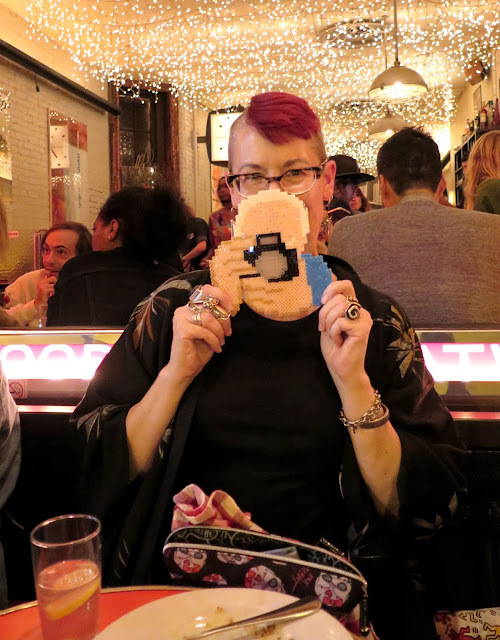 During a visit in October 2013, I was invited to tag along with the IF's to a party they had been invited to at the Tribeca Issey Miyake store. The theme was red and black, and I had purchased a red and black Japanese kimono style coat at the Manhattan Vintage Show that day, so I was appropriately attired. Mid-way through the evening (you can read about the party on my blog here) I spied a familiar figure walk through the door of the store - a spot of blue and khaki in the midst of a crowd of black and red - and my heart started to race. Jean was standing next to me, and I immediately began poking her with my elbow and saying "It's Bill!, it's Bill, it's Bill!" I had met designer Jean Paul Gaultier earlier that day, which was an absolute thrill, but it paled in comparison with coming face to face with Bill Cunningham. I snapped three quick shots of him as he was photographing people at the party, and almost passed out when he approached Jean and me. I tried hard to act nonchalant, as if I lived in New York and seeing him was no big deal, but failed miserably. I babbled something about how much I loved his work and how he was such an inspiration, and kind gentleman that he was, he nodded and said thank you. I'm sure I blushed as red as the pants I was wearing, but I felt like I had just won the lottery. Then, the unimaginable happened. 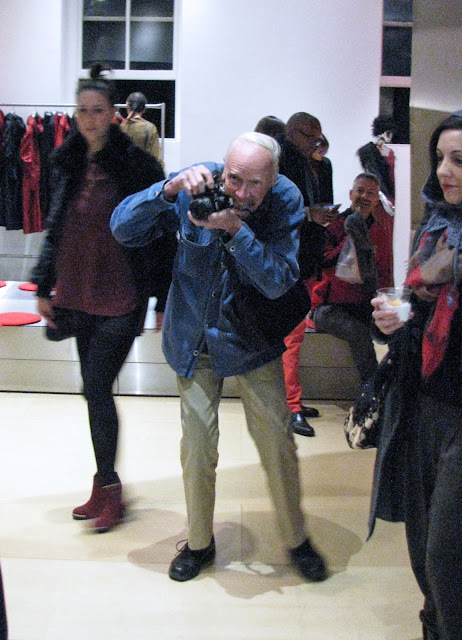 He took a photo of Jean and me standing on either side of a man wearing a wildly colourful Issey Miyake outfit. I had just been photographed by BILL CUNNINGHAM!! When Anna Wintour said that "We all dress for Bill", she didn't just mean all the fashion industry people, she meant everyone in New York who has ever secretly, or not so secretly, dreamed of appearing in one of his photo collages in the New York Times. And on the following Sunday, my dream came true. Click here, and scroll down to the bottom of the photo collage, to photo #45. Thank you, Mr. Cunningham, for giving a small-town girl her ultimate style validation. Your passionate commitment to documenting the ever-changing vista of personal style on the street inspired so many of us, and New York will be just a little less exciting without the chance of a "Bill" sighting. What a great read! I tried to spot Bill when I visited NYC, but I think he was already ill. Thought about him every day I was there. Blue without him, for sure. A delightful blog, I am so happy that you were photographed by Bill and love the details of the story, AND we are lucky to have you here in London Ontario, taking your own unique, quirky and fascinating photographs-keeping records of the Forest City. I've enjoyed this post particularly, and it's so lovely that you finally could meet him!. Even if I've never dreamed on meeting him, I feel sad now, this is a big lost for anyone who enjoy street style and fashion. Such a fabulous post!. Love it! Such a wonderful story. He was a true treasure and will be missed. ahhh, such a great Bill story. Thanks. I love this tribute to Bill, Shelley. You were so LUCKY to meet the man. It would be like meeting a movie star but way better! And to be photographed by him. Gaaa! Where else are we going to find someone now to give us such an honest eye on what's going on with style? For goodness sake, the man didn't like to get paid! And he didn't like the spotlight. Sad day, but, wow, he worked all the time - although I think a better verb would be "passioned" which I'm making up special for him. God bless him. He was a very lucky man who had the rare privilege of doing what he wanted to. He had a great, long, enviable run - something for the rest of us to aspire to. As for New Yorkers, now we must learn to dress for ourselves. What a man - we are all less happy because he's gone. Your necklace is simply amazing! A beautiful tribute! Heartfelt and wonderfully personal. I'm so happy that your dream came true, and the photo of you in Bill's New York Time's collage will always be with you. He was a gift to the world, and his spirit will live in our hearts always. Thank you for introducing me to this wonderful man.